As recent headlines would have us believe, this was perhaps Morrissey’s last run of performances on these humble shores and as such would fill you with anticipation for an evening cavalcade of farewell-worthy solo hits and Smiths classics. Though tonight’s performance had other plans. Reassuringly enough Mozza briefed onlookers with “I give you my life” before thundering into Bona Drag hit Suedehead accompanied by the rapturous welcome from the west London crowd. The stimulating bravado of Alma Matters paved the way for the set to take an instant dip with follow up B-side Ganglord leaving even the more animated of Morrissey fans to become somewhat disinterested. 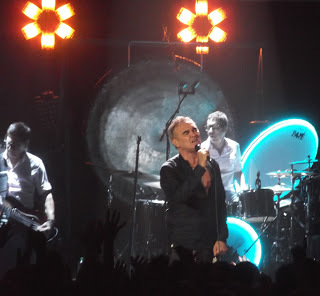 The latter of the set consisted of a lukewarm showcase carrying on from June’s detrimental NYC show where Morrissey himself ousted his more formidable works in favour of unreleased material from last years ‘World Peace is none of your Business’ record, as well as touching on his "zero (record) label interest" on the night. Concerns over the former Smiths front-man’s health could easily have been banished tonight as his dynamic looming presence over the crowd allowed only cherished contact to be made with a frenzied few, in-between the flailing lashes of the microphone wire reminiscent of a crestfallen Indiana Jones. This concern comes amid tail-end news of his stunted health in recent years including a slight altercation with Barrett’s disease; favourably now taking a back-seat and leaving the only remaining exterior affliction to be the unceasing greyness of his trademark quiff. As the show reaches its halfway point, I am amazed by the lack of controversy almost common-place at any Morrissey gig, but alas, my apprehension is too abrupt; as Mozza, always the paragon of thinking aloud, announces broadly “I pray to God… or something; I hope Jeremy Corbyn does not get to Buckingham Palace and bend before the third reich, it’s over, it’s over, it’s over.” Tactfully placed before drifting into a faultless albeit rendition of 'This World is full of Crashing Bores'. All in all it was a night of halted momentum from beginning to end, with the added technical mishap following a power outage on from Elvis Presley cover 'You’ll be Gone'; though once the Apollo’s minions had amended it’s resilient gloom the 56 year old darted back onstage to the tune of 'It’s a conspiracy' before signing the night off with 1988 classic 'Everyday is like Sunday'. As much of Morrissey fan as I am I can’t help but be disappointed with his (supposedly) last show especially as no effort seemed to be made to incorporate the more prized tracks within his disposal. 'Irish blood', 'English Heart', 'You have Killed Me' and 'First of the Gang to Die' were all denied a slot, but instead, valuable set time was awarded to the likes of 'Oboe Concerto' and 'Mama Lay softly on the Riverbed'. Perhaps when his new penguin book deal comes to light at the end of this month (September 24th) we will surely be able to determine any future touring plans, but If tonight’s lesson in the life and back catalogue of Moz is anything to go by, the future is as bleak as his demure appeal.